Time Release Study is a special tool developed by the World Customs Organization to measure effectiveness of operational procedures carried out by Customs, other regulatory agencies and private sector stakeholders in the standard processing of imports, exports, cross border and transit movements. A key activity identified in Nepal's Customs Reform and Modernization Strategies and Action Plan 2013-2017, it identifies the average time taken for clearance of consignments from entry to exit in the Customs area, enabling possible corrective measures to improve performance. This Study was undertaken to support trade facilitation measures being introduced by the Nepal Department of Customs to reduce bottlenecks to faster Customs clearance, and promote seamless movement of cargo traffic to and from the Country. The World Customs Organization (WCO) developed the WCO Framework of Standards to Secure and Facilitate Global Trade (SAFE), of which the Authorized Economic Operator (AEO) program is an integral part, referring to manufacturers, importers, exporters, brokers, carriers, consolidators, intermediaries, ports, airports, terminal operators, integrated operators, warehouses, distributors, and others that have been approved by or on behalf of a national Customs administration as complying with WCO or equivalent supply chain security standards. AEO accreditation provides several benefits, including immediate release procedures self-assessment, and relief from guarantee/bond requirements. With AEO programs globally on the rise, the International Chamber of Commerce has put together several recommendations for successful AEO programs that lead to tangible benefits and process improvements for companies of all sizes and sectors, without limiting opportunities for non-AEO traders. This biannual publication features updates, publications and forthcoming activities of regional and international organizations working on trade facilitation in the Asia-Pacific region, including the Asian Development Bank (ADB), the World Customs Organization (WCO), and the United Nations Economic and Social Commission for Asia and the Pacific. It includes highlights of the Asia Pacific Trade Facilitation Forum 2015 and the Train-the-Trainer Workshops on Customs Valuation through Post Clearance Audit being jointly implemented by the WCO and ADB in the 6 SASEC member countries. This issue also features an analysis on achieving seamless supply chains through implementing comprehensive and pragmatic national trade facilitation reform programs. The Revised Kyoto Convention is a blueprint for Customs reform, and the Nepali-language version will assist Nepal’s Department of Customs to align its Customs Act and associated regulations with RKC standards, enhance efficiency and effectiveness of the Customs administration, and facilitate trade through more transparent Customs procedures. The standards of the RKC in the General Annex and Specific Annexes include duty collection, Customs control, information technology usage, and Customs clearance, among others. 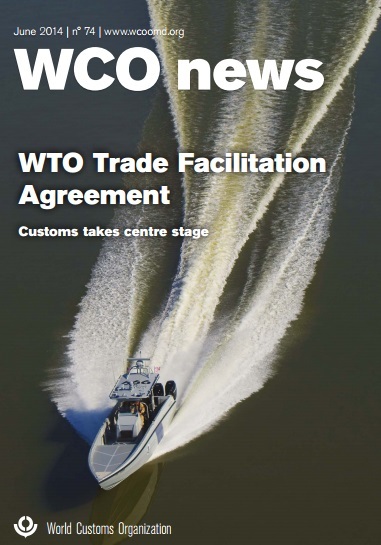 WCO News is a biannual newsletter of the World Customs Organization (WCO). This issue, released in June 2014, focuses on the World Trade Organization's (WTO) Agreement on Trade Facilitation. WCO's commitment to its implementation is highlighted and linkages between articles of the Agreement and WCO instruments and tools are explored. Also included is a feature on the benefits Authorized Economic Operator programmes bring supply chain companies.